This is a response to Paul Lukas' Uni Watch Power Rankings: NHL. Too high: Anaheim Ducks, No. 17 -- There was a point during these past playoffs when Teemu Selanne came out to chat with the media wearing a fantastic Guns N' Roses T-shirt, and it was perfect. Selanne is a rock star, and yet he's had to finish his career playing in one of the most bland jerseys in the league. I realize that No. 17 isn't exactly an endorsement of the jerseys, but the current Ducks look is in the bottom five. Thankfully, this season is the 20th anniversary of the Ducks, and the team has scheduled a few throwback nights to honor the Mighty Ducks. Too low: Chicago Blackhawks, No. 8 -- The Blackhawks' pregame scoreboard video entertainment is among the best in the league, and one of the moments that stands out is the animated stitching of the Blackhawks logo as the video takes fans through the history of the franchise. The logo is so loved in Chicago that Justin Bieber is now reviled by fans after taking a picture of the Stanley Cup while planting himself right on top of the dressing room floor's emblem. Simply put, the logo is a masterpiece. Chicago's whites are the best uniform in the league. That's not up for debate. That sweater alone should give the Blackhawks a spot in the top three. I realize I might be in the minority here, but I love the Blue Jackets' alternate jersey. It's easy to like Original Six jerseys, but Columbus has done well with all of its jerseys, creating a classic look that ties in the history of the state and the franchise -- a tough task for a former expansion franchise. The Winnipeg Jets (No. 18) were my runner-up vote for too low. That's a jersey that deserves to be in the top half of the league, at least. Especially considering the upgrade over the franchise's previous existence, which included some really bad Atlanta Thrashers jerseys. RIP Thrash. The 2014 Winter Classic jerseys should be noted. 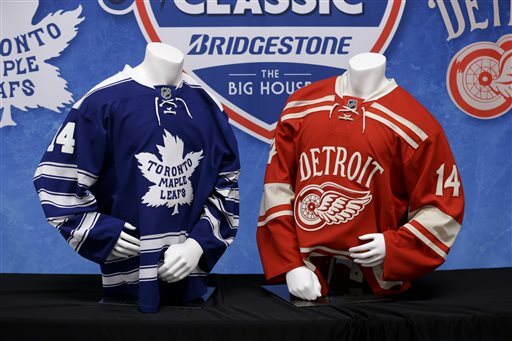 The look of the Red Wings and Maple Leafs Winter Classic sweaters have just the right touch of nostalgia without overdoing it. They're classic but not boring, which is a fine line. They're going to sell a ton of those, and rightfully so. Now it's your turn to make your picks: Rank the NHL's uniforms 1-30!